I really like Emilia's dress. And for once Millie BB is dressed age appropriately. Mandy's dress....hmmm....something about the length is weird to me. Mandy Moore looks like she's hiding a colostomy bag below the abdomen. The winner for women this round is Emilia Clarke, subtle details give one much to appraise without being too loud. Jessica Biel gets honorable mention, her dress looks unique for the event, but that's not a great photo to view it. The winner for men is Justin Timberlake, a classic look, but mostly because I just wasn't feeling Milo's outfit. What happened to Chrissy Teigen's face? Jessica Biel's dress looks like it's made out of the discarded wedding dresses of a half-dozen divorced women. Henson's dress makes her look very thick in the middle. I thought it was a fanny pack. Mandy Moore smuggling in her Bum Bag under that dress. Chrissy Tiegen could do so much better. As a fellow broad-shouldered, wide chested woman, I note to self: NEVER wear a picture frame neckline that meets beneath my chin. Terrible look on Teigen. I will not attempt it. 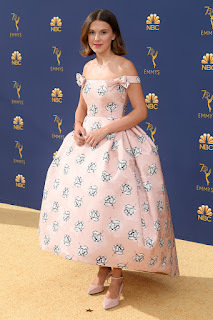 Mandy Moore's dress is beautiful, I gasped when I saw it on the screen, but she has to stop doing the cross legged pee pose in all of her photos, it absolutely ruins the line and silhouette in photos and she looks like an idiot.